There are plenty of roadblocks on the pathway to peace and happiness. Some of us have small pebbles strewn along the path. We can still drive or walk comfortably. Others are faced with traffic accidents or construction zones. These people could be slowed down for hours. They may even have to find an alternate route. Sometimes, they aren’t as traumatic as they seem. In the image above, there are numerous stamps. However, only one of them is being held up to the magnifying glass. 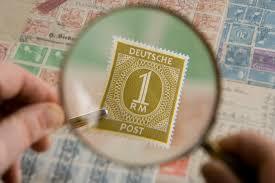 Therefore, it is the “biggest” stamp. It is the one on which the viewer focuses. There might as well be no other items in the picture at first glance. 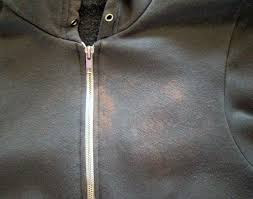 A hoodie is pictured in this close-up shot. It’s fashionable and warm. This jacket can go with many outfits. On the other hand, it has some spots. Most individuals wouldn’t want to wear it outside. They would be aware that people would concentrate on the spots rather than on the unblemished portion of the garment. A young boy was bothered by a neighborhood bully. This had been a problem for some time. He and his dad were trying to come up with solutions. 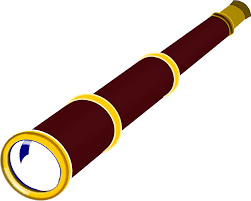 Finally, the young man changed his attitude when his dad gave him a telescope for Christmas. He told his dad that he was no longer intimidated by the tormentor. That’s because he looked at the mean young man through the wrong end of the telescope. This made the bully looked much smaller than he actually was. 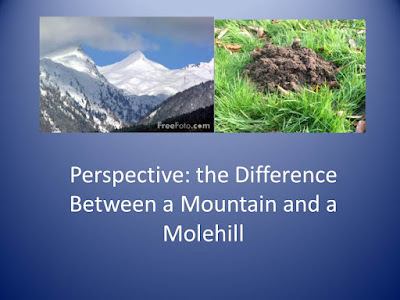 My good friend recently wrote a thought-provoking article about the importance of perspective. It’s great for a “Hmmm. That’s something to think about!” moment. Life is always about perspective. We can “magnify” either our trials or God’s promises. One choice can make us miserable; the other will may give us joy. Do you choose to magnify the negative or the positive?